Another busy day. Dave C-B scored best Booker flight of the day. After drinking the beer he told us again about how steeply to turn to get the six knot thermals. We're still tryimg to get that smile off his face. Cerdanya week two kicks off. The snow was thick on the ground as we drove to briefing, but the sun broke through and the new arrivals started site checks. 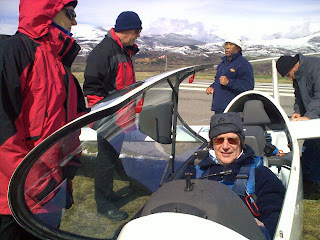 Stong thermals and a strong wind made the conditions sporty, Lots of soaring and some 5 hour plus flights. William P and Chris C climbed 2500 feet in 3 minutes in the k21. As I compile this at 19:40 Jane is still soaring in the k21. Beatiful sunshine every day so far but in the mountainous terrain each day presents different flying conditions, each with their unique opportunities. Chris, Ed, Barry, Jeremy and Adrian comprised the Booker component and Richard Clark arrived to join us on Tuesday. After a slow start to the week due to Andy Roch (Dunstable CFI) being the only instructor (we hope Glen is recovering well and send our best wishes). We have all had site checks and dual mountain souring experience. The presence of Ed has been invaluable. 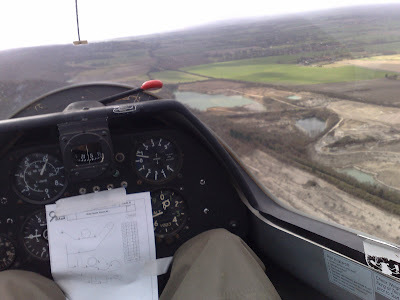 Me has been flying the Duo and sharing Andy's workload. We have had all forms of lift so far: valley thermals, rough rotor thermals, ridge lift and even 13 knot wave lift, taking us to exceptional heights. Chris and Ed have flown 987 and Barry and Jeremy JDV. We are developing our mountain flying skills with close flying to the hillsides, in narrow valleys and also ridges. Massive lift and sink (10+ up and down) demand strong awareness of the correct speed to fly and your route to retreat. The lack of visual reference to a 'horizontal' horizon within the mountainous terrain all make challenging and exhilerating flying. Looking forward to another sunny wavey day in paradise. Wednesday was very windy and unstable, so Booker's glider pilots sought alternative amusements. Jim had arrived with his glider and took the opportunity to sort out his water ballast system. Others variously lunched and walked and enjoyed what the area has to offer. Today is again very windy and unstable, so a party set off for the Elan Valley reservoir for a walk. Others set off home, including Jane who has to pack ready to join the Booker-Dunstable joint expedition to Cerdanya which is currently underway. Nothing has been heard from the week 1 crew, presumably they are having too much fun to post their reports. There will be news from week 2. Headline news: (1) Glyn G1 didn't land out and (2) Roland got into the wave. After a day of gales and kite flying, Tuesday was a lot calmer. Our friends from Scotland (Roy and Pete) set off with Phil King for Camarthen Bay, exploring wave quite different from the big systems of Aboyne. The rest of us were more modest in our aspirations. Glyn G1 and John 607 went to Long Mynd and nearly to Talgarth. Roland and John B didn't bother with being towed into the wave, they thermalled from 1200ft and made it to 6000ft, after which John flew the Junior. Andrew and Eric had a go in ECZ, as did Mike and Graham. Jane 118 and Lee LC launched late, by which time the clouds were disappearing, at least that's their excuse for not being able to work out what was going on. Last night was very wild, and today it is blowing hard and gusty, so we will wait to see if it calms down enough to rig. 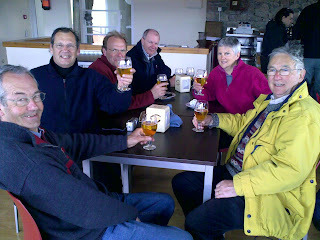 The annual expedition to Shobdon where we are the guests of Herefordshire Gliding Club is getting off to a good start. On Saturday tthe sky looked like pea soup which after lunch seemed to be consolidating into cumulus so we launched. The visibility was dreadful but there were quite good thermals and it was useful to get used to the site. John 607 and Andrew JTY had a go, Jane took Roland along in ECZ as an extra pair of eyes, and later Roland gave John B an introduction to the area. Sunday was a different airmass entirely. Bright and clear and a wind from the NW. Glyn G1 towed into wave at 4000ft, Roland and Graham released at 2000ft and were soon back on the ground. Jane 118 thought it looked liked thermals and released at 19ooft and spent over an hour trying to get to cloudbase before getting the idea and pushing forward into the blue at 2800ft and gently into the wave. Good climbs to 7500ft and skipping forward over the bars nearly to Long Mynd made for an excellent flight. 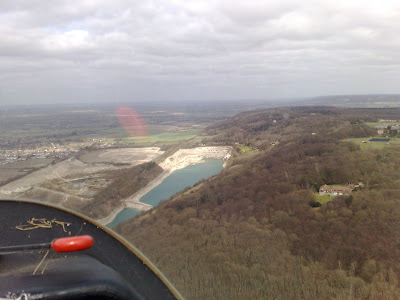 Andrew JTY took this a challenge and went to Shrewsbury, max height 9500ft. John H took a friend for a flight and then flew 607 but won't admit how high he got. Mike P had a good flight reaching 5500ft in JTY. John B had another thermalling flight with Roland, and then Eric did the same - Roland points out that he didn't get in the wave but he wasn't doing the flying. Glyn decided to inspect the paddocks the other side of Wapley Hill, carefully executing a base leg on his approach to his chosen field. Heggie took a break from towing (18 in all) to retrieve him so he was soon back on the field. Last flight of the day was Mike P and Graham who got to 10,000ft in ECZ where they stopped for lack of oxygen. This was Graham's first experience of wave flying and the grin says that he can now see what the fuss is about. Today it's blowing a gale but we are hopeful of more good flying after the front has passed. Plenty of people around early this morning - but they were here to take gliders & trailers to the expeditions at Cerdanya and Shobdon. Meanwhile on the airfield there was plenty of training, aerobatics and trial flights through the day. The forecast was for it to be thermic and generally blue. The small puffs of Cu coaxed Z3, 7Q, AJ, Z12 and others to attempt a task (BOB-BIC-CHN-BOO). Despite thermals kicking off from 09:30 between 800'-2500' there wasn't that much to go with later in the day. As a result I think several pundits actually did BOB-Stokenchurch-BOO before scuttling home. The day remained blue, with high level Cirrus killing the day early, combined with very poor viz (navigation being achieved with the aid of a white stick and a plumb line for most of tHe day). Still plenty to talk about in the bar later with Bronze C legs and type conversions achieved. Surface wind 10kts north-westerly. Soaring started earlier today with cumulus popping at 10.00 and soarable by 11.00 but blue by 12.00 when there were 5kt thermals everywhere up to 3000ft with improved visibility at 12km. I don’t know how high the thermals went later on – just incredible! Surface wind 10kts 060. Soaring started at 12.00 with 2/8 cumulus from 14.00 to 17.00 with well formed solid thermals giving easy 3-4kt climbs to 3000ft where the visibility was 8km. It was not suitable for early cross-countries but just perfect for dusting off the cobwebs and achieving those elusive bronze legs. The day dawned with an enthusiastic group who brought the gliders out from the hangar to the launch point. This enabled the training gliders to be available and for two of the single seaters to be ready for when needed. Meanwhile in the Clubhouse, a quick cup of coffee was grabbed before taking a seat for William Parker’s presentation on Field Landings for early Cross-Country pilots (a copy of the presentation, along with several other presentations are available from the members page on our website). Presented in William’s larconic style, the talk was well received by all who attended and was suitably punctuated by supporting comments made by those who’ve made the odd field landing or two. Post-lecture, it was over to the launch point to join in the flying fun. A series of aerobatic training sorties were flown by several members, aspiring cross-country pilots took the opportunity to practice their thermalling techniques and ab initio training and trial flights continued through the day. There was a glimmer of hope earlier in the week that the winds would build sufficiently for the ridge to be working. The local met observations after lunch suggested WNW 12-13kts which was probably a bit marginal. So, we ignored the local reading and despatched Jim White in Z12 to go and sample the conditions first hand. He soon reported that the ridge was working well and that there was a ready supply of 3kt thermals around too. Suitably inspired, Gary Nuttall and Stephen Williams took Booker’s K-21’s KCZ to the ridge and spent an hour mingling with the Halton gliders who were also making use of the great ridge conditions. William’s comments at the presentation on Field Landings in the morning about having suitable fields available was particularly pertinent when beating along the ridge at 600’! A 3kt climb at the Stokenchurch end of the ridge to 3000’ ensured a particularly easy return back to the airfield where the K-21 was pressganged back into ab-initio training follwed by some more aerobatics. Another great flying day with lots and lots of fun to be had. Felt a bit lonely out on the ridge today! Only Gary and Steve in KCZ and Alan in AJ joined me for the romp. Plenty of activity from Halton though. Wind varied between 21kts 300 to 17kts 285 at the end of the day. The ridge worked well all the way from Halton down to Watlington and that combined with 4kt+ climbs to 4500ft asml made for a great day's fun. I'd finished fixing the tailskid on the Nimbus (a perenial problem). The sky was beginning to show signs of the odd cumulus forming with wave bars showing higher up. The K13 was doing a steady business and the Junior was ready for a launch when Dave D asked if I fancied a flight in his Grob. It seemed like an ideal opportunity to see if it really was waving before the warm front arrived. With the engine throttled back to make it more like glider we took a few turns in the rapidly forming and dying thermals to climb from 1500 ft up to cloudbase just around the 2500 mark and then pushed on toward the SW. Over Chiltern Park there was definately a wave hole which allowed a slow climb to just over 3000. The hole then gradually started to fill in with rapidly forming wave shaped clouds which in turn allowed us to climb to nearly 4000. When we first had joined the wave it was possible to see over the cloud beyond the wave hole and gave the feeling we would soon be able to look down on cumulus organized around the wave. This was just not to be and although it was possible to climb in the odd disorganized lift it became obvious that having an engine would save us from becoming embedded in the rapidly approaching front. Eventually discretion proved the better part of valour and opening the throttle enabled us to climb out of the rapidly forming cloud and retreat downwind to a more sparsely cloud populated sky. Very shortly after landing the sky became totally overcast. Thanks Dave D for an enjoyable time in the air when it had been the last thing on my mind today. A good day which coincides with my day off, can't be bad. Scraping frost off the car was a good sign, and so it proved, a sky full of big cu and a cloudbase of around 3800ft. The first rig of the season and I'd managed to leave the GPS aerial at home, so I contented myself with 2 hours or so of locally soaring in excellent conditions, getting used to my glider again, not having flown it since our trip to Aboyne last October. Jim Z12 and Dave 918 did Buckingham-Chieveley and Glyn G1 went to Membury and back. Meanwhile back at base there was plenty happening, including Craig converting to the K18 after 4 solos in a K13, good progress. The barometer showed it should be stormy but it looked so tempting outside I took a peek at RASP and decided I could risk a flight starting around 12.00 and finishing by 14.00. With such a low pressure the clouds should have grown and thrown. I reckoned I'd have time to get in a Buckinham Church/Chievely and back before the deluge. How wrong can one be. The day just kept going. It was a steady trip making sure I didn't get anywhere near all those waterlogged fields. But most enjoyable all the same. I even managed to get round the TP's this time. Thanks to Peter Wyld for his loan of a GPS mouse which mean't my IPAQ could at last tell me how much height I needed/or had in hand. The trace is on the ladder. The weather came up pretty much as expected. Thermals started before midday but the climbs were weak and fluky. 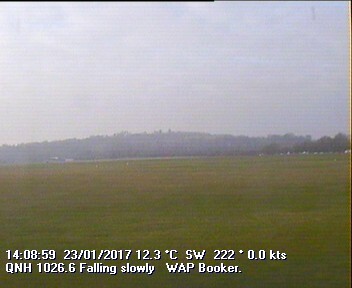 Set Marlborough - Chieveley to fly into a stiffening breeze with a start at cloudbase 3000ft above Booker. Conditions improved significantly on task to give average 3kt climbs and good streeting which allowed runs of about 30k and a 38k final glide. Flew a bit zig zag but did the 130k in 1h 32m which was satisfactory for early March. Max altitude achieved was 4234amsl. Cloud spread out from about 3pm. We were all too busy over the weekend to report the news. Saturday began with Denis Campbell's thought-provoking talk on the different ways of assessing situations and making decisions. The rest of the day was very busy with over 50 flights under an unpromising sky which proved surprisingly soarable, Dave Bundock kept a Pegasus in the sky for nearly 2 hours. There were a number of acvhievements, including Henry Ross converting to the Discus and Steve Williams becoming a full cat instructor. In the evening the AGM was very well attended, and 4 new committee members were elected, John Herman, Steve Williams, Emily Todd and Adrian Hegner. Our new chairman is Geoff Tabbner, replacing Roland Wales who is standing down to enjoy a well-earned break. After the meeting we retired to the Live and Let Live for a meal and more discussion. Sunday started dull but the skies cleared and became very soarable for a time, although the northerly crosswind combined with runway 35 being closed meant that less experienced pilots were unable to fly solo. We welcomed new course member Nick, who came for a trial lesson on Saturday and was so impressed by our well-organised operation and the excitement of flying that he immediately signed up for a course and came along to continue his training.